Oh my goodness......if you love caramel popcorn but are like us and don't have the right sugar, a candy thermometer, etc. then you must, must, must try this!!! 1. Pop your popcorn. Salt to taste. 3. Add a tiny glug (that's a measurement right?!?) of maple syrup and mix well. 4. Pour over popcorn and stir to coat. 5. Let us know what you think!......good eh?! Thanks so much for visiting my blog and for the helpful tip! 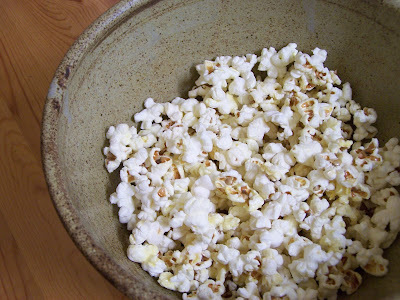 We love maple popcorn...sometimes we will make kettle corn and use some maple sugar instead of sugar,mmm. I've always wanted to know how to make kettle corn, do you need a special pot? I'm in! And yes, I consider glug to be a measurement! Ooh, gonna try this tonight! Oh this looks yummy- we make maple popcorn with brown sugar added too, and this looks much healthier!